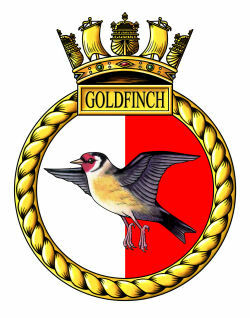 (1945) Full control transferred to Admiralty in April. 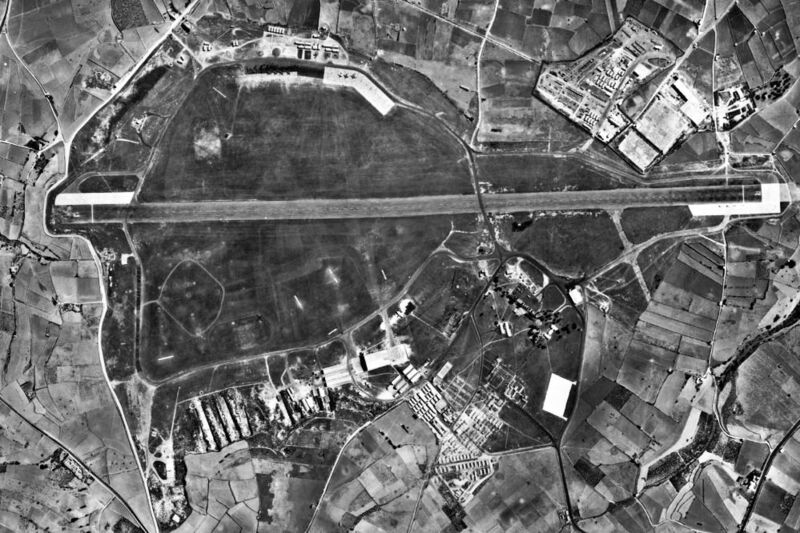 Airfield under reconstructed and repair. 09.06.1953 and returned to R.A.F. control. Commander J.A.D. 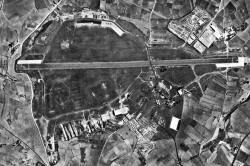 Wroughton, D.S.C., R.N. Fleet Requirement Unit (728 Squadron lees pilotless planes, which will be operated from Hal Far). Accommodation for 1 R.A.F. Squadron. 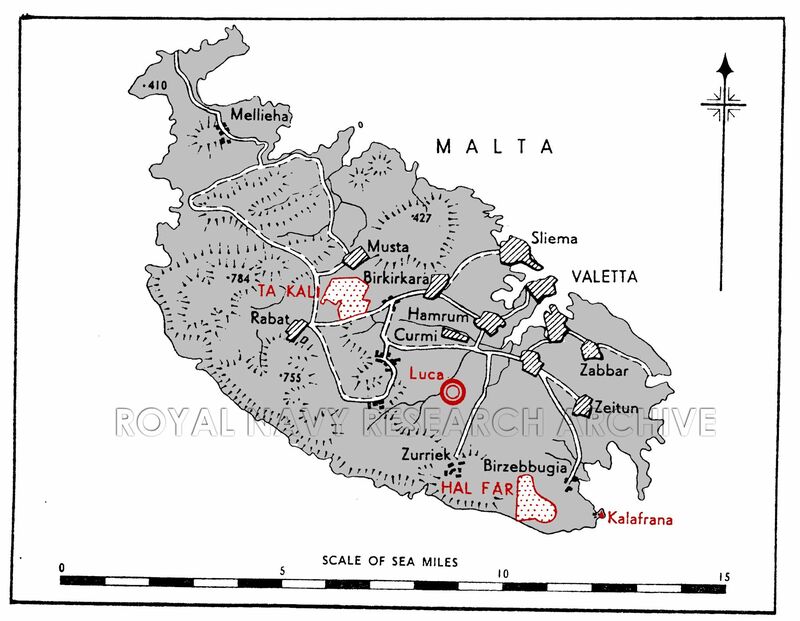 The airfield lies near the centre of Malta, 4 miles W. of Valletta and one mile NE. of Rabat. Mosta lies. ½ mile N.
The town and harbour of Valletta. The Church done at Mosta. Access by first Glass read to Valletta distant 5 mile. (R), and to Rabat, distant 1½ miles (R). Accesses by road to all parts of the Island, but many of the roads are marrow and badly surfaced. No nail communication. Estimative pert facilities at Valletta. Control Building near centre on SW. side of runway. Caution: Great care mat be exercised when landing, taking off or morring in E. and NE. winds, as velocities up to 70 knots sometime occur. 13/31 QDM. 135° -315° .... 965 x 50 yds. * Runway extended to 2000 x 50 yds. post war. 835 ycls. NE/SW and 750 yds. NE/SW. T. landing area has a grass surface roughly oval in shape; Unserviceable after prolonged rains..
A total run of 2,000 yds. from NE. to Sw., can be provided made up of 965 yds. of runway, 853 yds. of grassed surface and 200 yds. of what was formerly tamac runway, but at present in a state of disrepair. It is intended to mark the continuation of-the extension across the grass area by atones blocks sunk into the ground at 25 yd. intervals. The ground slopes down to NW. and SE. from the NW. end of the runway. *Not valid after post war reconstruction. Rising ground to W., with hills rising to 668' within 1 mile W. of airfield's NW boundary, and Nadur Tower, (785'), distant 2 miles W. Hills rising to 738' distant 2¾ miles W.
The following are reported but their exact positions are red confirmed. E ........ Chimney distant 2 miles. SSE ........4 W/T maasts, 100’ distant 3 miles. None recommended. No station D/F facilities. Approach entirely visible. Illuminated portable landing T for positioning by side of duty runway. (1945) Landmark beacon (MA) and Occult at R.A.F. Luca. (1948) Airfield beacon flashing red 'LU' at R.A.F. Luca. (1945) H/F., VH/F. D/F to Island only available through R.A.F. Sector Control. (1945) Portable night lighting (to be installed). (1948) Portable night lighting (to be installed). Gosse Neck. None at Ta Kali. Radio compass beacon in position 35˚ 49' N. 14˚ 32' E.
(1948) 3 transmitters, 6 receivers. (1948) 6 transmitters, 6 receivers. (1945) a new Camp for all personnel is to be built. At present, Officers’ quarters at St. Agatha's Convent, Rabat, Chiefs and P.O. 's at Tel Virtu Camp, Rabat, and ratings at the P.D.V. Hotel, Rabat. 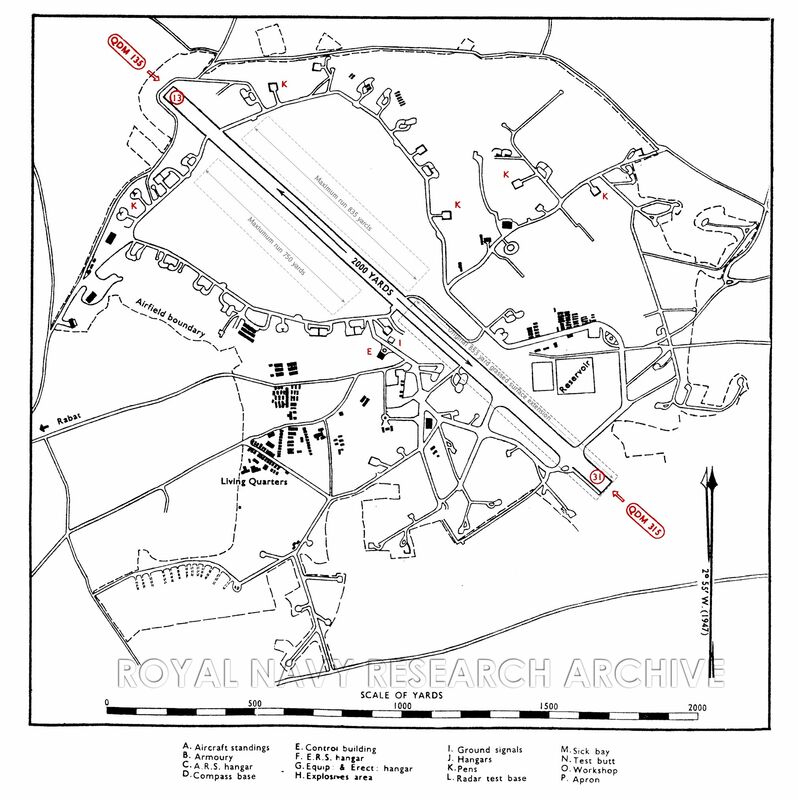 (1948) new camps located SE and SW of centre of runway. Adequate only for small station. One already exists; to be used for smell aircraft. A larger one, for twin engined aircraft, is to be made from concrete base of existing double pen. 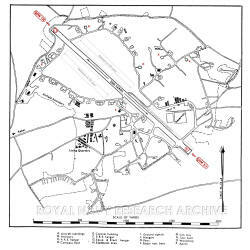 (1945) Dispersal tracks, leading to pens; 26 pens for twin engined aircraft and 60 hardstandings for single engined aircraft exist. Additional hardstanding, to be constructed am required. Pens being removed. (1948) 12 hard standings for single engined aircraft. Additional hardstanding, to be constructed am required. None; aircraft to remain in the open or use pens that have been roofed in. Local facilities. Sick Bay: No bed accommodation except for immediate treatment of crashes. Hospitals: R.N.H. Bighi., 8 miles, 90th General Hospital 2 miles. (1948) As above, with Bed accommodation:, 3 officers, 18 ratings, one isolation if extra staff available. 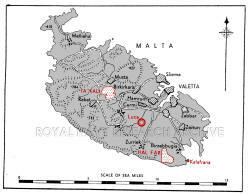 Data supplied by meteorological Station in Valletta. Prevailing winds approximately in the direction of the runway, light in summer. (1945) 12,000 gallon underground storage tanks: 100 octane only. (1945)1,000 gallon underground storage tanks. (1948) 2,000 gallon underground storage tanks. A second 2.0000 gallon tank to be installed. (1945) 2,000 gallon tank and pump to be installed. (1945) Four Dorland hangars to be erected for use as maintenance hangars. Workshop facilities to be provided by Mobile Workshop Unit using evicting hardstandings and huts. Six "Compact C" portable hangars to be installed. As directed by flying control. Equipped with 12 Defiant TT. & Swordfish. Disembarked from H.M.S. 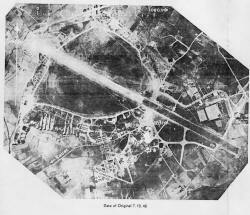 FORMIDABLE 12.09.1943 Moved to RAF Sidi Ahmed 16.09.1943 returned 17.09.1943. Re-embarked in H.M.S. FORMIDABLE 20.09.1943. Disembarked from H.M.S. FORMIDABLE 12.09.1943 to 20.09.1943. Takali in 1947 - new accommodation sites are comleted.